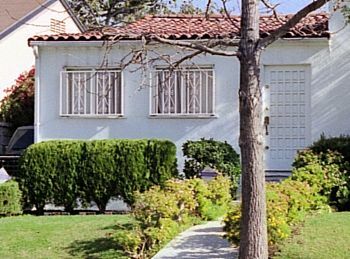 When I bought my 83-year-old, dilapidated, future dream home, the purchase included an arbor vitae hedge that lined the walkway to the front door. 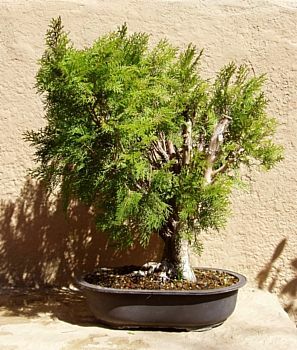 Sometimes good bonsai material can be found in your front yard. The five four-foot-tall plants that made up the hedge had been neglected for much of their fifty years, but – like the house – they had good bone structure and wonderful potential. My dream home is undergoing a major makeover, and here is the renovation of one of the arbor vitae. Hedge fun times five in front of my biggest trash-to-treasure acquisition. After removing the top halves of the trees and cleaning off the dead foliage, I fed and watered frequently to encourage new feeder roots. After almost a year, I dug all five trees out of their original homes and put them into into pots. 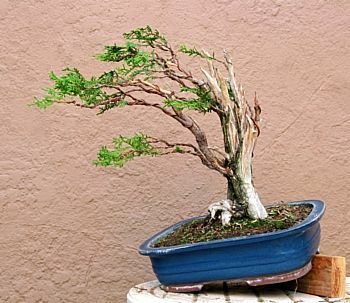 All had the typical arbor vitae structure: a single upright trunk splitting off into numerous upright branches with an ovoid silhouette of foliage. The shaggy tree looks quite content in a pot. What set this tree apart from the others was its awful rootage. From any view, the base of the trunk was ugly. When faced with a flaw, I remove it; if I can't remove it, I hide it; if it can't be hidden, I try to incorporate it into the design. From every angle, the rootage was revolting. My solution was to angle the trunk and bury much of the unsightly root. 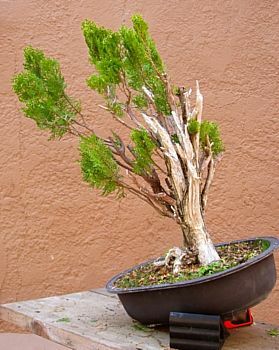 The angled trunk could become a slant style or windswept bonsai. There was no main trunk to develop slant-style branching, so I opted for a windswept style. This tree had a massive number of branches: some very thick, others thin and spindly. After trimming the branches and before carving the jin. 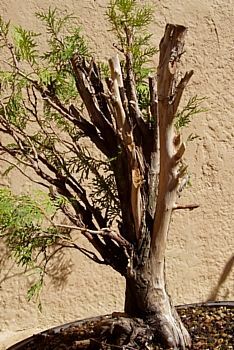 In thinning them out, I carved, tapered, and shaped the thickest branches into interesting jin that swept toward the live branches. After carving the jin and after the branches had grown out. After carving this tree, I set it aside to carve roof rafters, frame a walled courtyard, and build a two-story turret entry to my new home. For a year, all I did to the tree was water and feed it. During this time, the branches grew longer and budded back, and the foliage became lush. 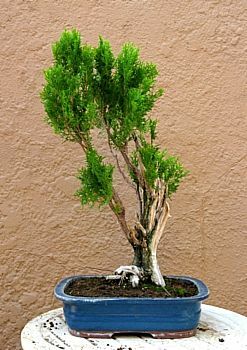 The arbor vitae just before styling. Some judicious pruning, a few pieces of wire, and a block of wood were all that was needed to give a first impression of a windswept tree. After wiring and shaping the branches. 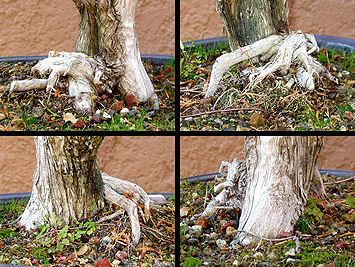 Carved, wired, and repotted in an appropriate shallow, unglazed pot, this once-neglected hedge is now a beautiful bonsai. The revolting rootage no longer distracts but now provides stability to the leaning trunk. 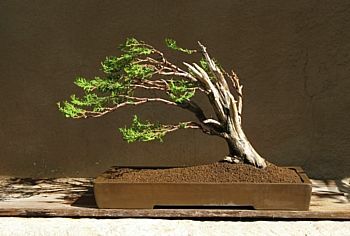 This classic windswept evokes the power of the wind as the trunk and branches bend from the forces of nature. Unfortunately, my dream home still evokes the forces of a demolition crew. One transformation done – another really big transformation to do! Bent by a constant breeze. © 2010 Cheryl Manning. All rights reserved.